Rick's Rather Rich Ice Cream is a popular ice cream shop within walking distance of my house. However, I never seem to go there on foot. I tend to stop by there in the car, on the way back from errands, so that I can dash home with some ice cream quickly, before it melts. Today I picked up a quart of mint chip, and a quart of lavender honey ice cream. Both great summer flavors. As promised, this Rick's ice cream tasted rich and creamy, and the mint flavoring tasted authentic. The chocolate chips were a little on the hard/frozen side (a common occurrence with some chocolate chips); but I could still taste a nice dark chocolate flavor. A little fresh mint for a garnish, and life was good. I managed to eat this just before it melted into a bowl of sweet mint soup. 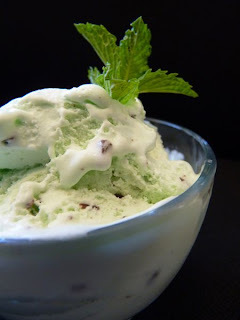 Today was Day #5 of Chocolate and Mint Ice Cream Theme Week.